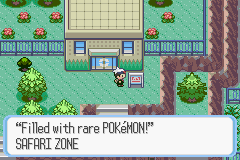 The Safari Zone is located on Route 121, near Mt. Pyre. It is a place to catch all sorts of wild Pokemon that you won't be able to find anywhere else in the game. First, however, you must have the PokeBlock Case, an items that holds PokeBlocks that can be obtained from a little girl in Slateport City's Contest House. When you go into the Safari Zone, a person will charge you $500 for 30 Safari Balls, some time, and to play the Safari Game. The game ends when you've reached 500 steps, or when you've used up all your Safari Balls. The Safari Zone is divided into four areas: Northeast, Northwest, Southeast, and Southwest. Different areas have different Pokemon. You can also fish for Pokemon, or surf on the water. Remember, the better the rod, the more chance you have at meeting the Pokemon you want. When you do find a wild Pokemon, which really isn't hard, you'll want to try to catch it. Unlike the regular battle scene, the Safari Zone battle scene gives you four options: Ball, Go Near, PokeBlock, and Run. You may not battle wild Pokemon using your own in the Safari Zone. Read on for an explanation of each option. 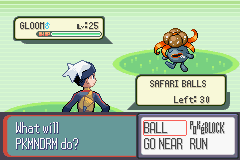 The Ball option let's you throw one of your many Safari Balls. Always first try this. If the Pokemon doesn't go into the ball, throw a PokeBlock. It makes the Pokemon curious. Other times, the Pokemon completely ignores the PokeBlock, and will watch you carefully. Try the Ball again. If it still doesn not work, Go Near the Pokemon, and throw another Ball. Keep on repeating this process until you catch it. Throw as many balls as you can. You've paid $500 for it anyway. There are PokeBlock feeders in the grasses. What you might want to do is put a PokeBlock in there, and it will lure Pokemon who like that specific taste towards you.